With only a few more hours left in August, September could be very well a great month for fall migration here in the Ohio Valley. For the past two weekends I’ve been out in the field, particularly in the Lost Bridge and Oxbow area, setting up the old spotting scope watching and waiting. These two areas are notorious for having rarities drop in, (the Whimbrel in the Spring that I dipped on after breaking all sorts of traffic laws in my attempt to get there) and with Jon in tow this last Sunday we made out pretty well. The Saturday prior was just as good when arrived at Lost Bridge I ran into a group of birders from the local Audubon Society on one of their monthly field trips. That morning 2 Red-necked Phalaropes were the star as each birder strained through their spotting scopes to catch these rarities. Trying to get any decent photograph was futile so after many tries to capture any of the great birds seen during the 2 weekends, I just gave up. In sprite of the fact I have no pictures to share I do have what I feel is a good list of some darn good birds. And as it normally is when I go birding during the heat of the Summer, I usually knock off by lunch time and head for home. With my vacation into the wilds of the Wolverine State over, it seems we always ask the same question. Why does it take so long for the vacation to start, and how does it end so quickly? 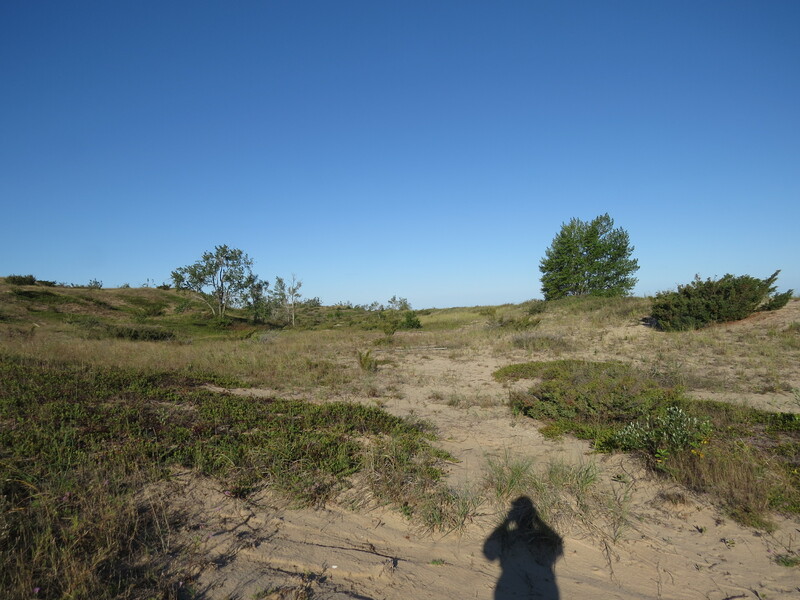 With the cold slap of reality of “work” once again staring me in the face, and my photos sorted and cleaned up, it’s time for my wrap-up of the one day I went birding at Sleeping Bear Dunes National Lake Shore. 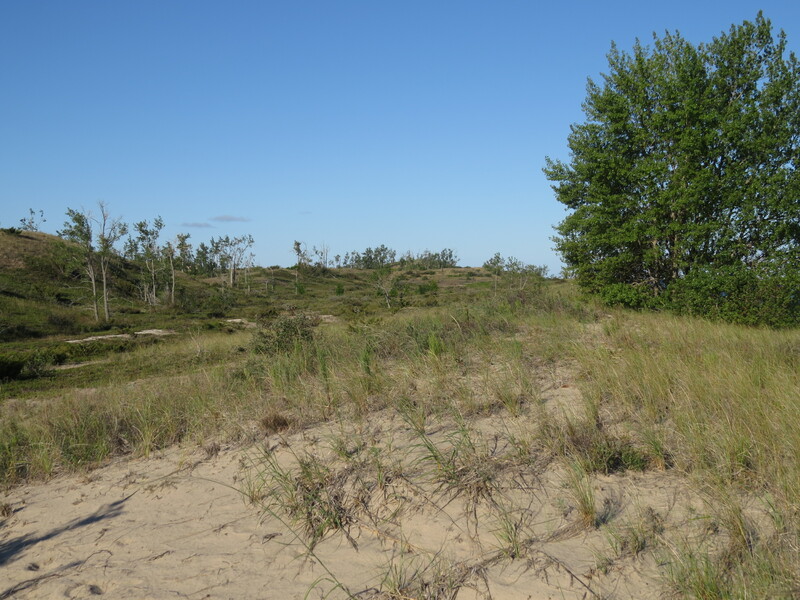 With never having visited this part of Michigan before, we really wanted to see and do as much as we could. There were wineries and breweries that needed to be visited, along with small towns and tourist attractions. And with only so much time in the day I had to designate one morning/afternoon when I can some birding in. 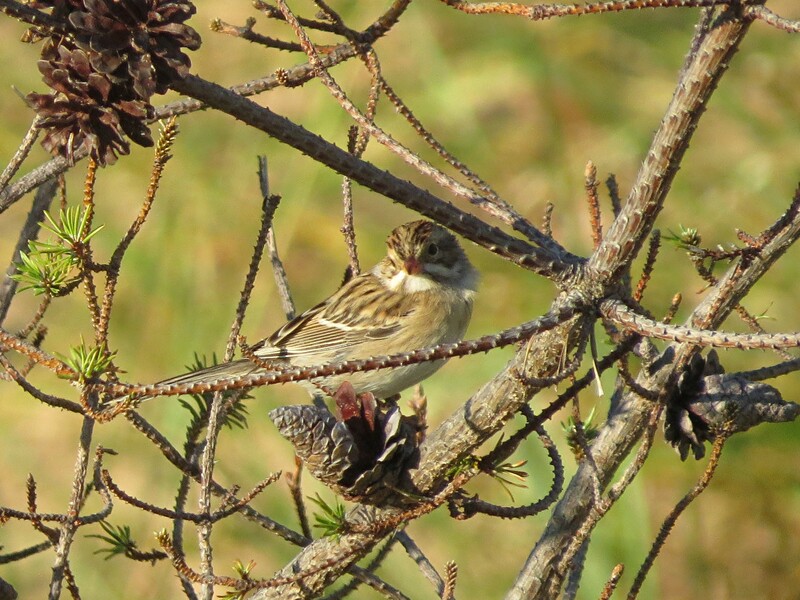 There were some encouraging reports on eBird that had several Clay-colored Sparrows and Piping Plovers in and around Sleeping Bear Point. So this was my one-shot destination. The drive took about 45 minutes from where we were staying outside of Northport, and following M-22 the drive took me through picturesque villages of Leland, Glen Arbor (Home of Cherry Republic) and Glen Haven. 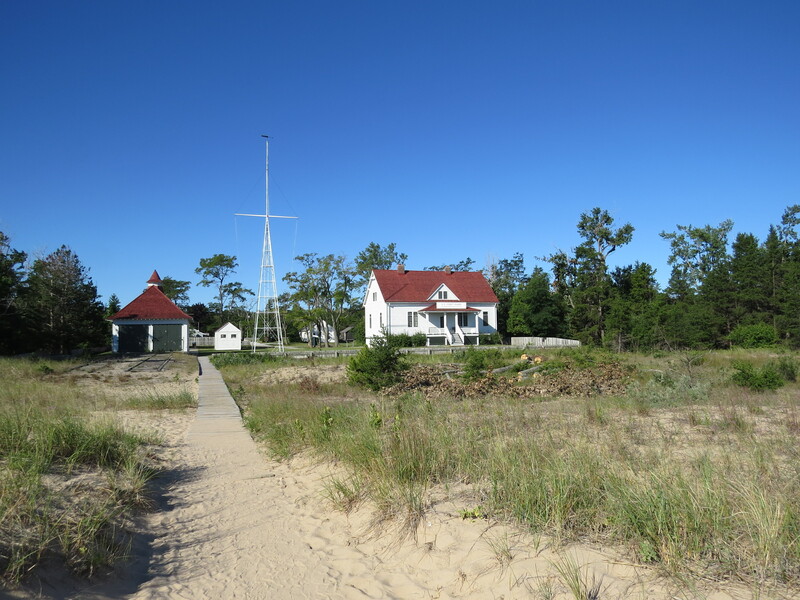 I followed the map on my GPS and traveled through Glen Haven and finally parked at the old Sleeping Bear Point Coast Guard Station which has been turned into a maritime museum. Being a pretty early Wednesday morning there was no one around. So I made my way through the Coast Guard Station compound towards Lake Michigan as the sun started to rise behind me. 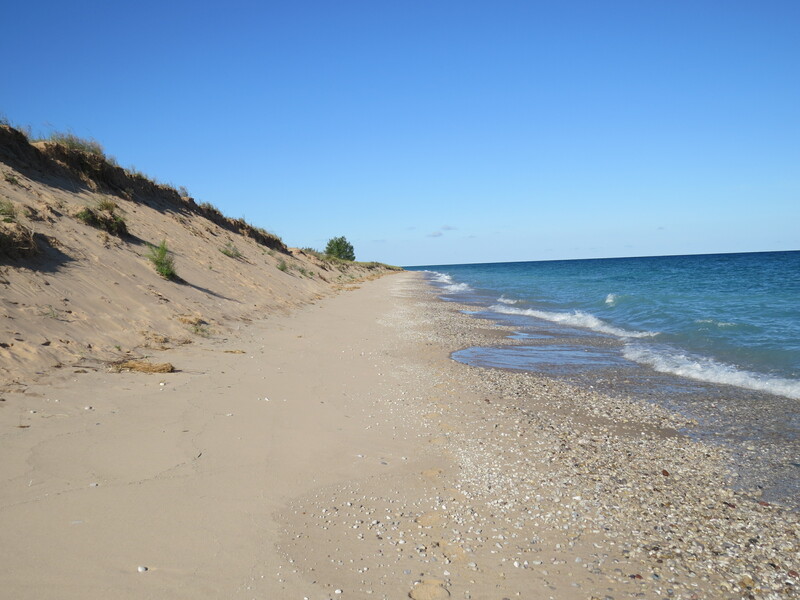 I turned towards my left and started to walk northwest towards Sleeping Bear Point. As I hiked along I really didn’t know what to expect when it came to birds. Being by a really large body of water one would expect the usual Ring-billed and Herring Gulls. A lone Killdeer was the first plover sighted as it scurried before me. A couple of Semipalmated Sandpipers were feeding along the lakes edge and offered a good photo-op as the sun was in the perfect position. 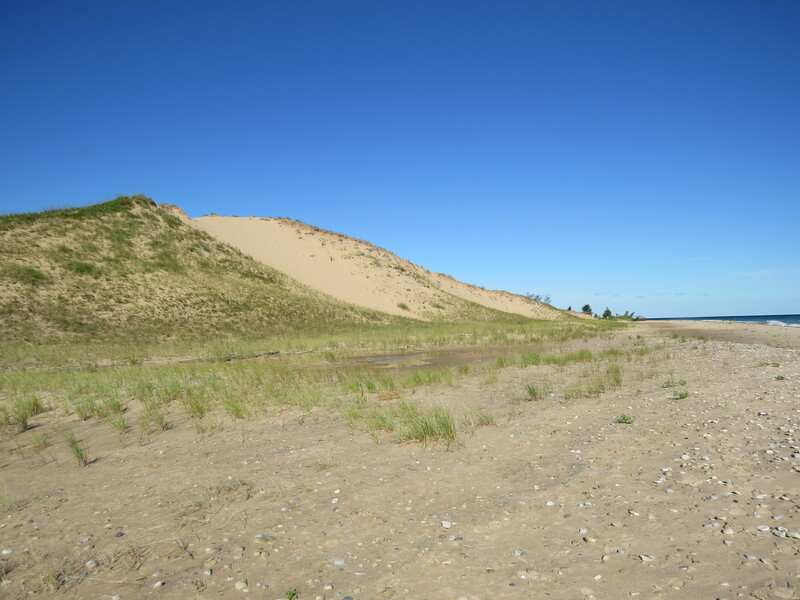 As I walked a large sand dune squeezed me between itself and the lake with just about 10 feet of space to walk. Three American Kestrels kited above me as the wind blew steady off the lake all morning. A solo flying Peregrine Falcon was being mobbed by a gang of Crows. The falcon eventually lighted, and not wanting to pass up any chance to get a picture, I crept closer. 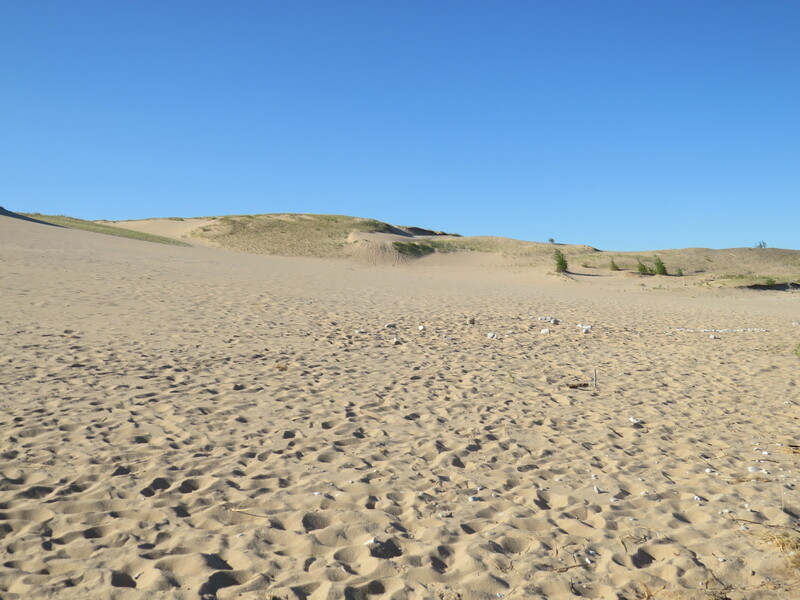 Well the falcon wanted no part of me, let alone the Crows, so it flew off over the dune. I was beginning to think that I was going to dip on my 2 target birds, however as a large sandy clearing opened up with scrubby bushes and short, stunted trees I noticed some small bird activity. They kept moving away from me towards where a sand dune joined the beach at right angles. 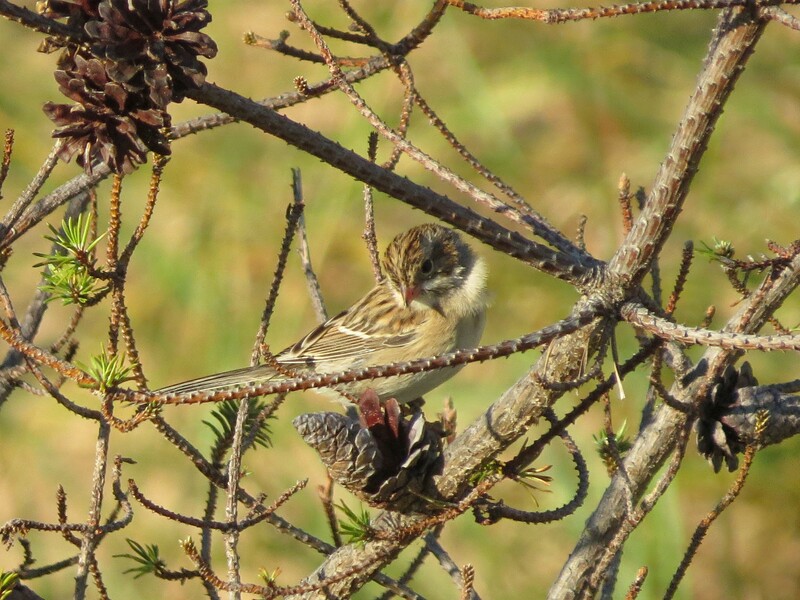 Large bushes and small trees sheltered 10-12 Sparrows, but what species? I couldn’t get my bins on them long enough to get a good ID, they just wouldn’t hold still long enough. I paused for a moment and “pished”. A couple curious Sparrows jumped up on some low branches. 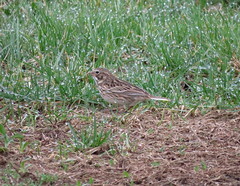 Clay-colored Sparrows, hooray for me! Not wanting to pass up this opportunity, I pulled out my camera and fired off a few shots before they moved on. 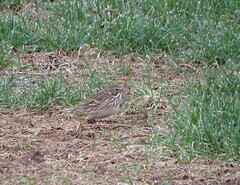 Now I’m 100% sure these are Clay-colored Sparrows. However when I got home at processed the pictures and noticed that these birds were missing the classic field marking, I started to doubt myself. The one thing missing is the classic whitish median crown stripe. All the other field marks fit for a Clay-colored, but this stripe on the crown. All the field guides showed the white stripe, and this was upsetting. It wasn’t till I pulled out go-to book on Sparrows, “The Sparrows of the United States and Canada” by James Rising and David Beadle. 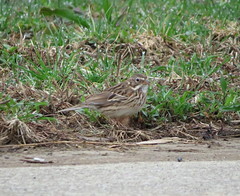 “crown streaked blackish and median stripe buffy”, for a juvenile Clay-colored Sparrow. Validation is sweet. 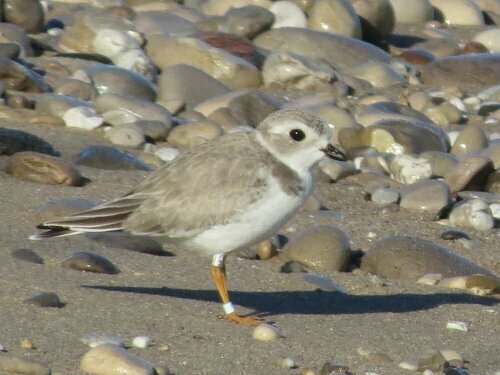 After leaving the Sparrows I made my way back to the beach and my hunt of a Piping Plover. I continued walking for about 20 minutes always stopping and scanning the beach for any movement, then sweep back over land for anything else. 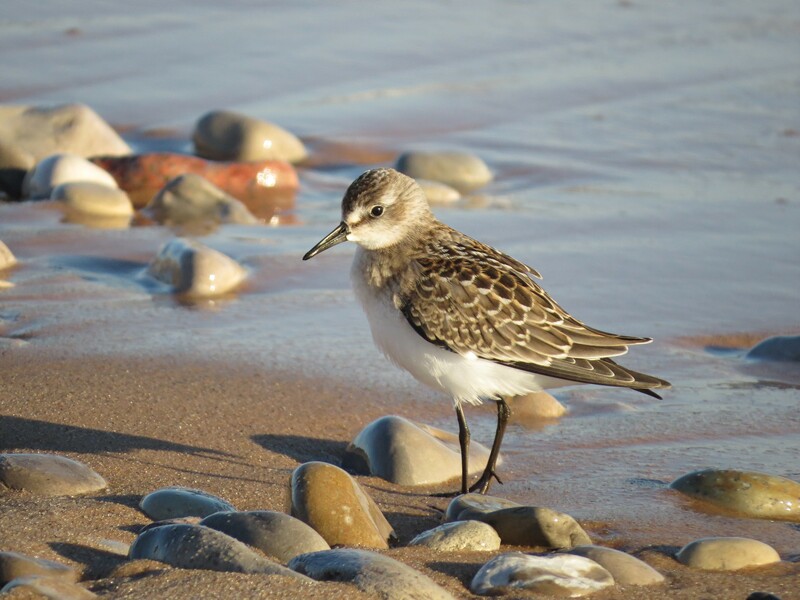 It was during one stop while scanning the beach I noticed the 2 Semipalmated Sandpipers I had seen earlier, but this time there was another bird with it. One with orange/yellow legs. 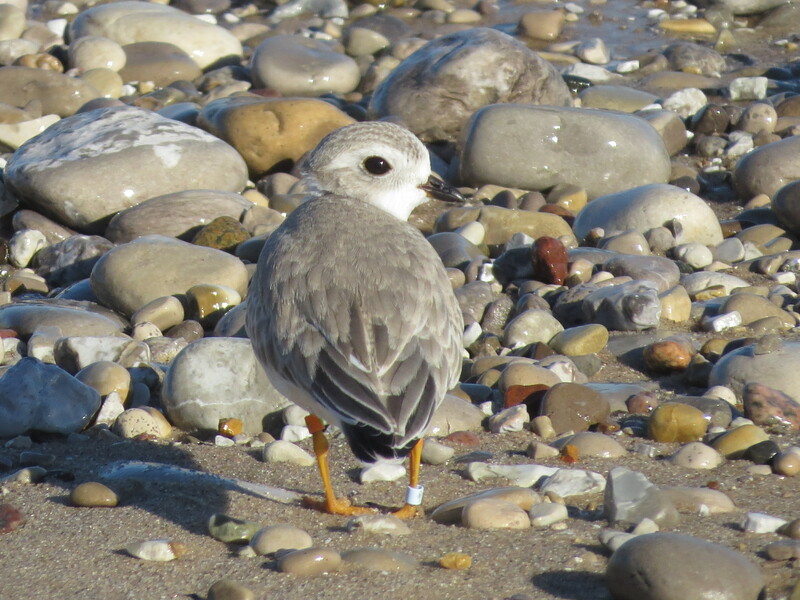 Piping Plover! If it hadn’t moved it would have been really difficult to pick out among all the pebbles that littered the beach. As you can see by this picture how well they blend into their surrounding habitat. 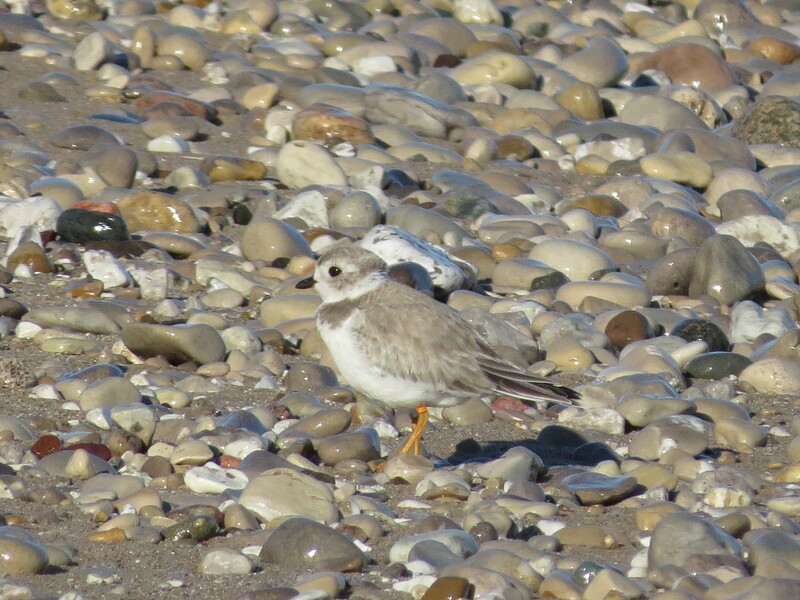 Now I had to set myself up to get the best photographs of the Plover without really disturbing it. The bird would move up and down the beach feeding without too much regard for me, so if I stood still it would get close, or if it walked away from me I had to climb up the bank and position myself for a better shot. 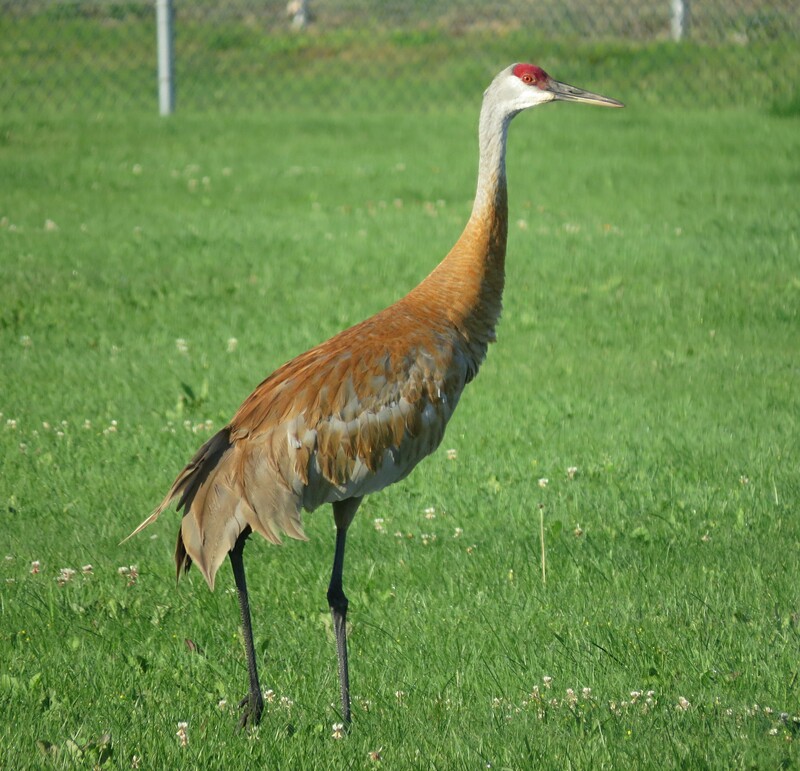 As you can see this bird has some serious bands on it’s legs. Being an endangered species this is normal and really the best way to track this beautiful bird. 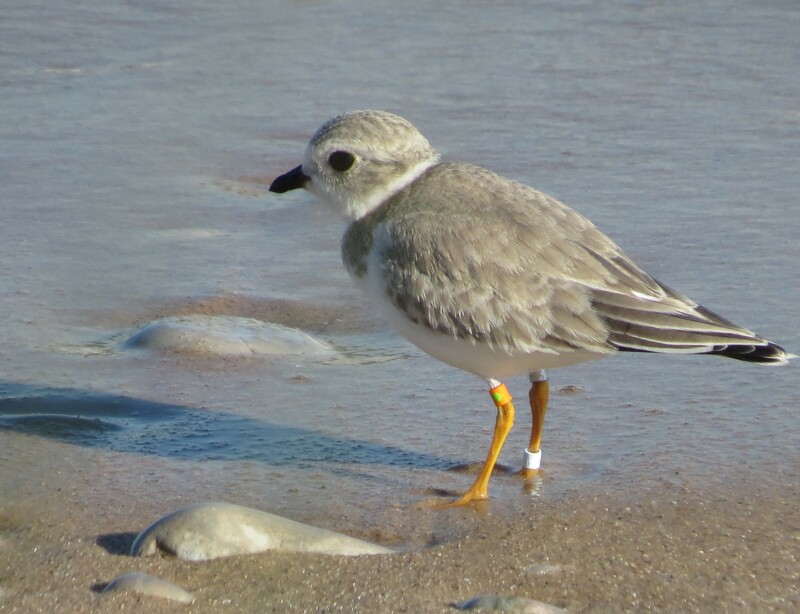 As a matter of fact right now as I’m writing this blog post a juvenile Piping Plover is being seen up on Lake Erie in Ohio without any bands yet. This is about as rare as the bird itself. I could have followed this bird all day taking endless pictures, but there comes a time when enough is enough and call it a very successful day. And with that I drove back to Glen Arbor to meet Kathy and have a Black Cherry Cream Soda from Cherry Republic. Mmmmmmm Delicious. 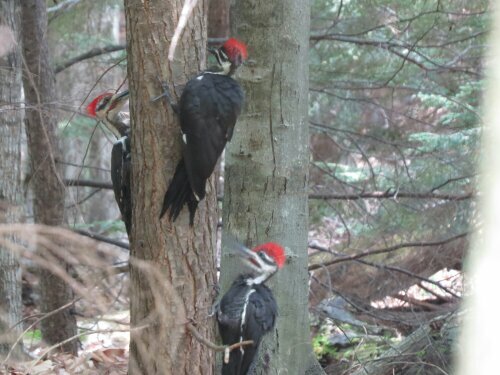 Not just 1, or 2, however I’ve never seen 3 Pileated Woodpeckers at one time. 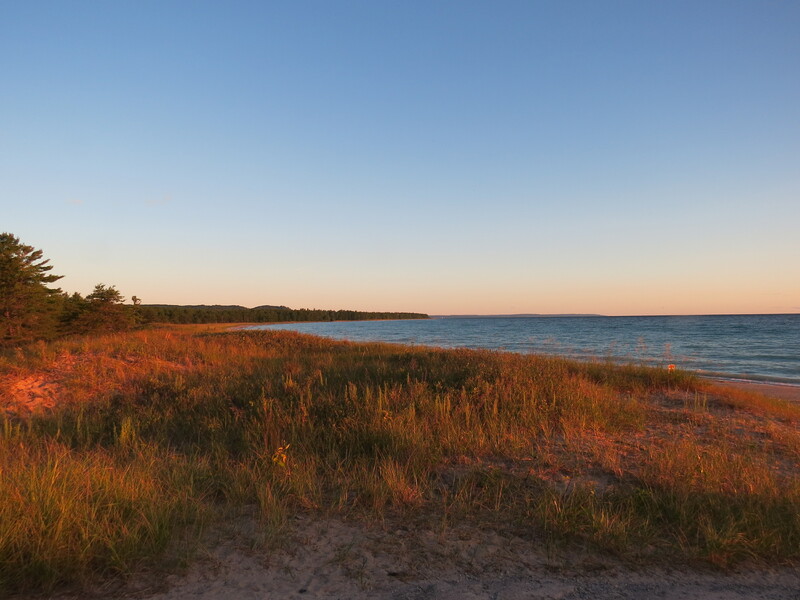 And this time they were just 15 feet from the front door of the house we rented here in Northport Michigan. 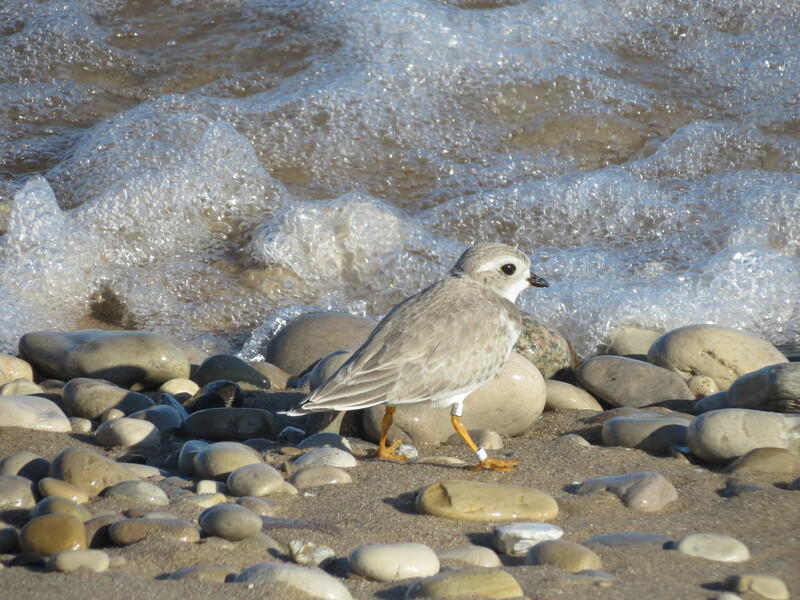 A solitary non-breeding Piping Plover was observed for about an hour on an isolated stretch of beach west of the old Coast Guard Station, which is now a Nautical Museum at Sleeping Bear Dunes National Lake Shore. I was watching the news the other day and one of the stories they showed was about how some of the larger airline companies were changing the size requirements of your carry-on luggage. And it came as no surprise that the changes were against the passenger and the limitations ones carry-on should be. So this got me to start looking into this since I’ll be flying down to Texas this November for the Rio Grande Valley Birding Festival. And after doing some digging on the internet I came up with a few surprises, especially when you find out that all carriers are not alike. Oh no, everyone is different when it comes to the dimensions of your carry on suitcase. Now I’m not a big fan of traveling by air, unless there are time and distance constraints that dictate that I do. And never have I flown with anything more than my binoculars and camera, so flying to Texas with all my birding gear started to worry me. The most important thing about this whole trip was the fact that I’m not allowing any of my optics to be stowed away in checked baggage. It has to be with me at all times. If my luggage is lost I’ll still be able to go birding and worry about clean underwear and socks when I get a few free hours to run to the store. The second important thing to think about is the size of the suitcase you’re using to carry all your gear in. And with most airlines allowing different dimension suitcases on board in the overhead compartment I needed to find out what my carrier will allow, which turns out to be United Airlines brand new size requirements at 22′ x 14′ x 9′. The tripod will not be going into my carry-on, but in my checked luggage. I’ve been reading that tripods pose a gray area for the TSA Agents. Some let you through while other won’t. So to avoid any confusion it’s going into my checked luggage. 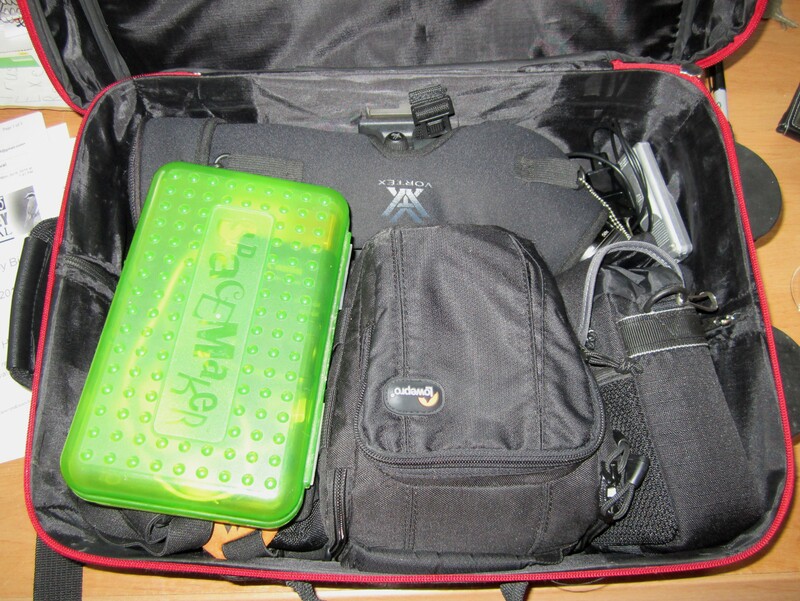 Now when it come to the suitcase dimensions for carry-on luggage I had to do some Internet searching to find out what the big carriers allow on their jets/airplanes. The dimensions listed below are height, width, depth. So as you can see there seems to be differences in what carriers allow and don’t. So do your homework before setting off if you happen to be flying and taking more birding gear than you usually do.